Gentry Boxers is dedicated to increasing the life span of our beautiful boxers by applying the science of health screening, holistic supports, the use of minimal vaccinations and toxins, the use of homeopathic medicines, and using Animal Communication to discuss health concerns with the animals themselves. On the following pages you can learn about the most common health issues that boxers face. We screen for all of them; hips, elbows, eyes, thyroids, hearts, spines. The two most common health concerns that are fatal to boxers are heart problems (cardiomyopathy and sub-aortic stenosis) and spinal problems (degenerative myelopathy). Although there is some wiggle room in a breeding program on non-fatal issues, in my opinion there is not on issues that can cause severe symptoms and death. Therefore, we do not compromise on heart issues nor degenerative myelopathy. Degenerative Myelopathy (aka DM) is often considered trivial in some breeding programs. It can be called an old dog's disease, thus there is less concern for this health issue than some others. 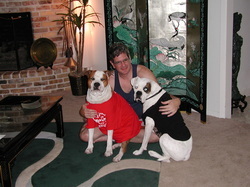 We had our first experience with it in 2009-2010 when our beloved white boxer Petie expressed the symptoms of DM. He was born before the DM genome test was available, and we didn't know he had two alleles for DM that put him at risk for the disease. When the test came out we screened him and he came back positive with two alleles (At Risk). He developed symptoms in 2009, first dragging a back toe. A paralysis crept up from his toes up through his hips and into his spine, making ambulation difficult. He kept his dignity and happy bounce for about 18 months, but life was challenging for him. We didn't have room for a dog to ambulate with a wheelchair, so helped him in other ways, using MuttLuck booties and helping him get where he wanted to go. However, DM is utimatately fatal and currently has no cure. The American Boxer Club Charitable Health Foundation is funding research into this disease and we support them with donations from sales of our calendars and donations of services and products from The Dog Breeder Store and our Zazzle Boxer Store. Petie died on November 12, 2010, after letting us know that his time had come to pass. We were heartbroken to lose him at only 11 years of age. We do not want our clients to go through this experience. Therefore, we will do everything possible not to produce puppies either through our own nursery or through our stud dogs who will symptomize for DM. Dogs that are At Risk should be raised naturally, detoxed from vaccines (or preferably not vaccinated), and live a holistic lifestyle with raw diet and natural supports. Don't ask to breed to any of our dogs with a DM allele without screening for DM and having an open mind regarding natural rearing supports. We know that a large percentage of boxers are not clear of DM alleles and that it will take considerable time before this disease is cured. However, we believe that with mindful breeding choices and natural rearing techniques, we can continue to move forward in the goal to produce no boxers who will ever suffer from DM again.